Banstead Village - Where's the cherry tree-lined road? Where's the cherry tree-lined road? 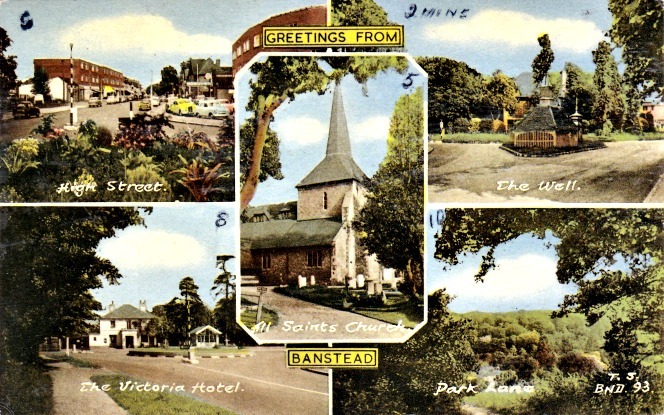 This multiview postcard of Banstead is from the late 1950s or early 1960s. As for the cherry tree-lined road two minutes from the Well… any thoughts? Published by F. Frith & Co of Reigate. "Just to let you know that we are settling down in our new abode. I like Banstead very much, & John is beginning to do so. – We like our house (which is on quite a pretty cherry tree lined road) very much. It is very light & pleasant, with a french window & an all glass kitchen door which look out on to a 60 ft. back garden, - not over big, but it really grows, & is giving us great pleasure. We have 28 different kinds of plants in bloom just now. "Banstead air is very good as we are fairly high, in the green belt & close to very nice country & the North Downs. All the places on the reverse side are within 2 to 10 mins walk away from our house. It is in a most convenient situation. We have been up to the Festival Hall three times & to the Albert Hall once since we came." Hi. The trees in photo 5 look a little young to be lining a road in 1963 - and is that on the right a hawthorn? It's also quite a feat to make it (uphill!) to the Well in 2 minutes, unless perhaps one is very close to the roundabout. I'm wondering if it might be Yewlands Close? The far side of the close has reasonably large cherry trees just coming into bloom in the Google Earth streetscene images.